Bridget provided key leadership by keeping us on task with the checklist and a pen. Gina, Taylor, and Max — friends from high school — formed the backbone of our group. But I think Bailey was the one who really made it work. 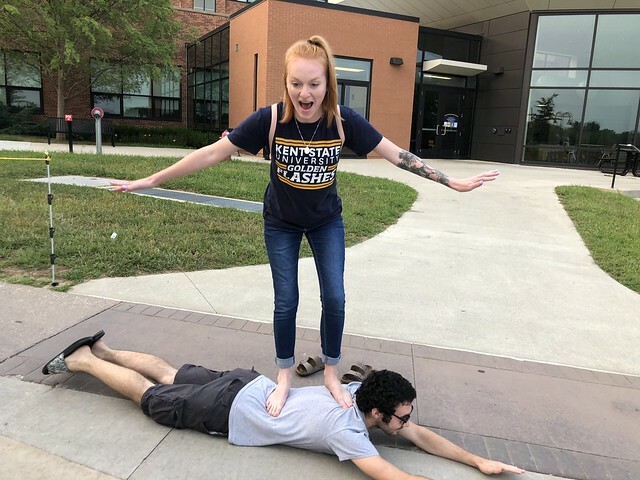 He courageously accepted the challenge to perform an interpretive dance in the middle of the Student Center (and it was beautiful!). He allowed his body to be used as a surfboard for a red-headed stranger on the Esplanade. He coached me — with surprising vigor — through the process of eating grass. And he was the one who first spotted Jared, on the other side of Manchester Field. Within thirty seconds of their initial embrace — old friends reconnecting in a new place — Jared had put down his bags, Bailey had removed the rocks from his pockets, and they were wrestling on the grass. Jared quickly overpowered Bailey, but as soon as they bounced up from the turf they were smiling again. And we had a powerful new ally on our team. Jared wasted no time in getting after the incomplete items on our Scavenger Hunt checklist. He called out to strangers, recruiting their help with a seemingly-irresistible mix of interrogative coaxing and imperative charisma. His solution to the problem of finding two people with the same birthday? Just stand at a busy crossroads outside of the Eastway residence halls and start calling out: “What’s your birthday?!? Anyone here got a March 12th birthday?! 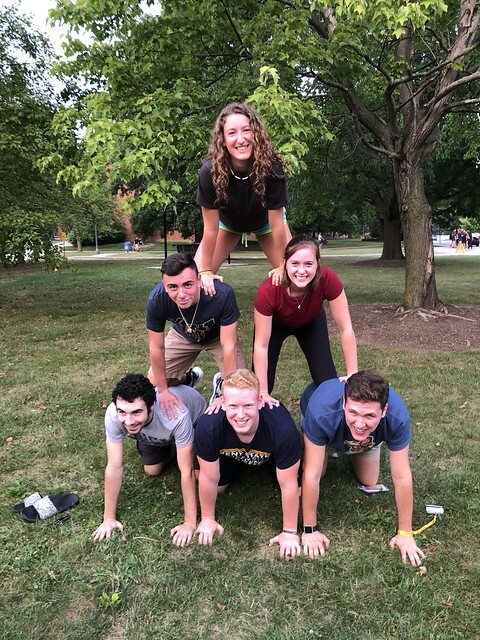 ?” Soon, the rest of our team was doing the same thing, laughing and grasping at straws, trying to find the proverbial needle in the haystack of new freshmen on campus. Amazingly, though, Jared’s strategy worked. A girl in a yellow shirt heard Max calling out “February 15th,” and she confirmed a birthday match — not only for her, but also for her twin sister who was walking a few paces behind her! 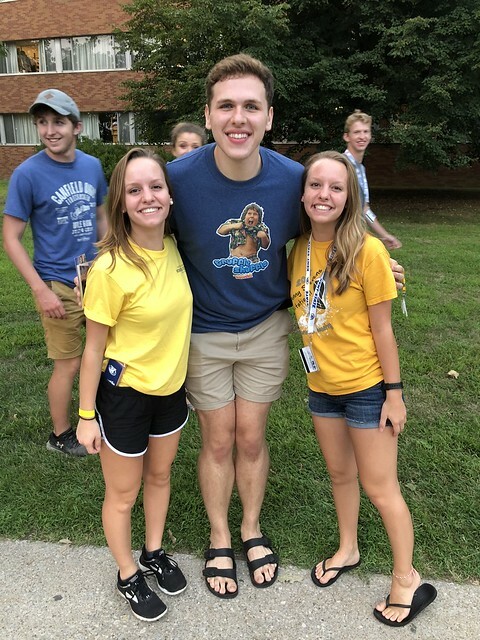 We snapped a picture with the three of them, and then we started walking towards the library to finish our checklist, our group continually growing larger: Annie and Megan now in tow, in addition to the rest of the group. 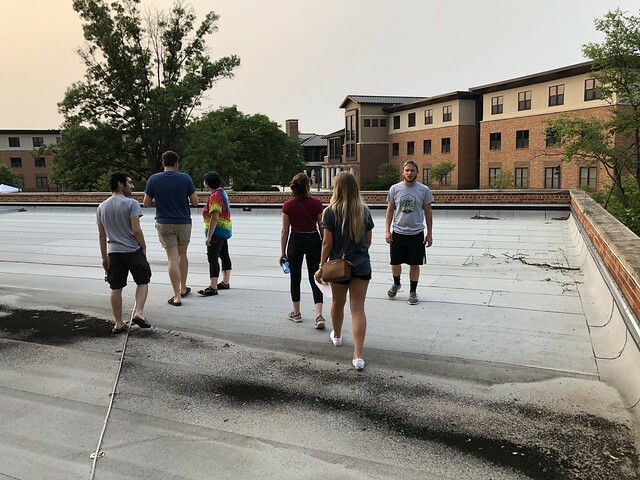 I was amazed by the talents and personalities represented in this group of new Kent State students who had been pure strangers just 75 minutes earlier. When all the points had been tallied, we ended up in third place (even though I thought we were going to win, for sure). Still, everyone seemed to have a good time. 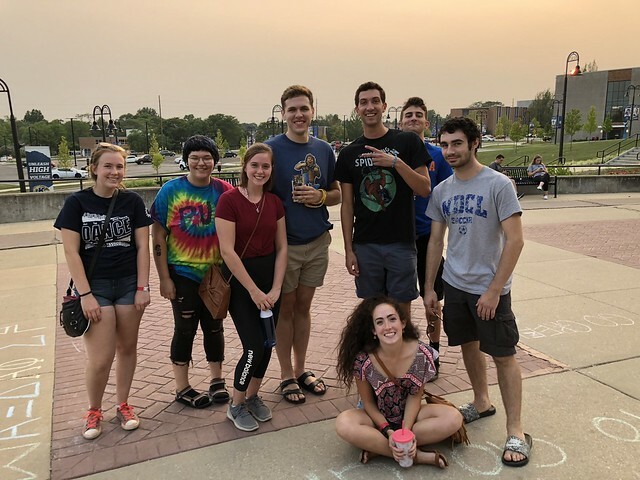 Before everyone scattered to get to their residence hall meetings, we exchanged contact information so we could meet up again for ice cream some other time. As I rode my bicycle home in the dark, I smiled to remember our evening’s shenanigans and to think of what might yet be in store for the Class of 2022 in the days, weeks, months, and years to come. This entry was posted in Church, H2O Kent, Kent, Photography, Recreation, Transition. Bookmark the permalink.